A man has been arrested after three attempted robberies on users of the Grindr dating app. 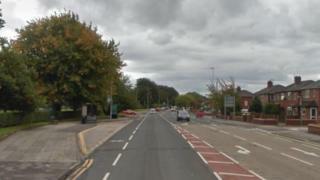 Three men were targeted in Salford and Bury by a man who demanded their car keys at knifepoint. In the most recent attack, a man in his 20s was stabbed several times by his "date" in his car in Pendlebury. Greater Manchester Police (GMP) said a 21-year-old man had been arrested on suspicion of robbery and section 18 assault and remained in custody. The latest victim had parked his car, with his "date" inside, in Bolton Road at about 17:45 GMT on Tuesday when the attacker demanded he hand over his car keys. GMP believe the same man carried out two earlier attempted carjackings on Monday. The victim received cuts to his throat, back and forearm and was taken to hospital for treatment before he was later discharged. Ch Insp Amanda Delamore said: "Our thoughts remain with the three victims who have all been left incredibly shaken by their ordeals and officers will continue to provide them with support at this distressing time."